Wahama junior Ethan VanMatre rolls over a River Valley opponent during a 120-pound match at the 2017 Skyline Bowling Invitational held on Dec. 30, 2017, at Gallia Academy High School in Centenary, Ohio. SAINT MARYS, W.Va. — All it takes is one. The Wahama wrestling team finished second out of nine teams in the St. Marys Blue Devil Alumni Tournament on Saturday in Pleasants County, falling to Wirt County by a single point. The champion Tigers compiled a team total of 40.5 points on the day, while the White Falcons’ runner-up total was 39.5. The host Blue Devils were third with a total of 25, followed by Tyler Consolidated (24), South Harrison (18), Frankfort (15), Buffalo (12), Poca (11.5) and Robert C. Byrd (3.5). A quartet of White Falcons claimed first place finishes with unbeaten records in the tournament, they were seniors Ethan Herdman and Jase Heckaman, and juniors Ethan VanMatre and Antonio Serevicz. 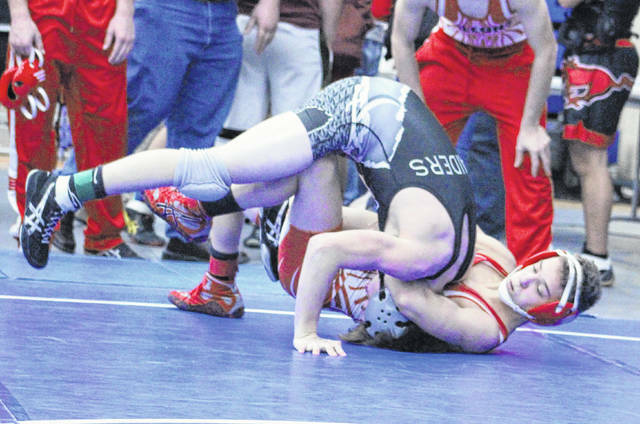 Herdman finished 5-0 in the 152-pound weight class, picking up a quartet of pinfall victories. Serevicz also claimed four pinfalls and was 4-0 at 220 pounds. VanMatre and Heckaman earned two pinfalls apiece, with VanMatre going 3-0 at 120 and Heckaman going 2-0 at 160. WHS sophomore Trevor Hunt was had the only runner-up finish for the Red and White, going 3-1 with two pinfalls and one technical fall win. Trey Peters and Christian Thomas were the White Falcons’ third place finishers, with Emma Thompson and Shawn Taylor both placing fourth. Peters was 3-2 with two pinfalls at 126 pounds, Thomas was 2-2 with one pin at 170, while Thompson and Taylor were both 0-3 in the 106 and 195 weight classes respectively. The White Falcons will hit the mats again on Friday and Saturday in the WSAZ Invitational in Huntington.